9780765337238 | $25.99 / $29.99 Can. The next adventure of The Seven Sins’ Michael “The Tyrant” Tiranno, is a pulse pounding actionthriller as he takes on a worldwide human trafficking cabal. Five years have passed since Michael Tiranno saved the city of Las Vegas from a terrorist attack. And now a new enemy has surfaced in Eastern Europe in the form of an allpowerful organization called Black Scorpion. Once a victim of human trafficking himself, the shadowy group’s crazed leader, Vladimir Dracu, has become the mastermind behind the scourge’s infestation on a global scale. And now he’s set his sights on Michael Tiranno for reasons birthed in a painful secret past that have scarred both men. Already facing a myriad of problems, Michael once more must rise to the challenge of confronting an allpowerful enemy who is exploiting and ravaging innocents all across the globe and has set nothing less than all of America as its new victim. 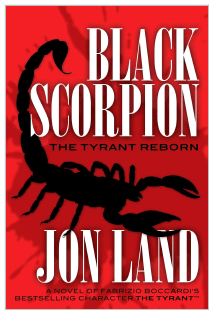 Black Scorpion has also taken hostage Scarlett Swan, the woman Michael loves, a beautiful archaeologist who was following the dangerous trail of the origins of the ancient relic that both defines and empowers Michael, a discovery that could change history and the perception of mankind’s very origins. With the deck and the odds stacked against him, Michael must come to learn and embrace his true destiny in becoming the Tyrant reborn as a dark knight to triumph over ultimate evil and stop the sting of Black Scorpion from undermining all of the Unite States and plunging Las Vegas into chaos and anarchy.